I accept that many things are hard for Leo because he's autistic, that I can't understand why they're hard if I approach those roadblocks like a non-autistic person would, but that if I try to see and understand matters from his perspective -- his unique autistic perspective -- things get easier for both of us. But I can't make everything in his life about being autistic either, because that means I end up underestimating him in other ways, specifically regarding how much he is maturing. Oftentimes, I'm the one who's lagging behind, in terms of adjusting to the sometimes decreasing amounts of backup Leo needs to navigate this world. ...the woman manning the gate told Leo he couldn't go in, because he was too big, and because there were lots of little kids. She wasn't nice about it, either. Reader, I almost died. How could Leo not have a meltdown (not a tantrum, a meltdown), given how excited he was, and how long he'd been waiting to go, yet things didn't go as planned? I was paralyzed. I hadn't considered the possibility that Leo would be barred from a pumpkin patch -- it's never happened before -- and I had no back up plan to help Leo deal with such a huge disappointment. 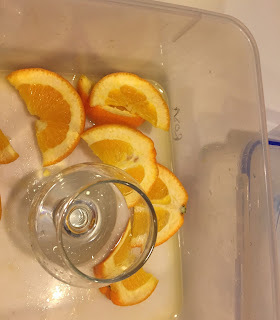 Image: A snifter of mezcal, and some orange slices. After a few sputtering beats, I paraphrased what the Grinchy gatekeeper said -- told Leo I was sorry, but that apparently the pumpkin patch was for little kids right now and he he had grown so much since last Halloween that now he was too big, and I hadn't known he could be too big. That I knew he really wanted to go, but maybe he could settle for ... (crap) a trip to the forbidden halls of Dairy Queen instead? And you know what? Leo didn't protest or complain once. He agreed to go to Dairy Queen for a small plain vanilla cone that he's really, really not supposed to have but, you know, desperate times; he ate the cone with delight, and we went home and passed an uneventful evening. I was still determined to get Leo to a &!!%*! pumpkin patch. And a few days later, I was not only successful but found a patch ten times better than that silly run-of-the-mill place that wouldn't let him in. This place had inflatable human-size hamster balls that float on water! Leo was ecstatic, and I was amped up on joy for my dude (and his little sister, and her friend). All Hail the Floating Bubble! Yet you do not share with us the location of this magical place? The magic happens daily in Menlo Park, at the corner of El Camino & Valparaiso. They had the hamster balls at the San Mateo County fair and boy were they fun.